Any green field Data Center brings a huge challenge in maintaining a right balance between business, facility and technology demands. None of them in todays date are static infact each one of the facets mentioned are constantly changing and bring tremendous impact on cost as well as the business done by organizations today. In2IT's Green Field Data Center services provides a comprehensive approach towards understanding the business and cost impact of choosing the right technology, technique, tools, infrastructure and facility. 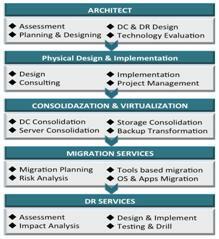 Services includes assessment, consulting and building up of any new Data Center from scratch and typically includes Infrastructure Assessment, Planning and Design, Evaluation and setup of technology, Achitecture Consulting and DR Setup.